Abstract: Trudy Govier defends the distinction (elsewhere taken for granted) between arguments and explanations. I will discuss what making the distinction really amounts to and try to show that the kind of distinction she wants to make between products (rather than between speech-acts whose distinctness from each other is uncontroversial) is under-motivated. In particular, I will show that her discussion of Hempel’s covering law model is a terminological muddle. In this section I want to narrow down what the distinction between arguments and explanations would amount to. What we are faced with, then, is a dispute not about whether there is a distinction between explanations and justifications: a distinction between them is maintained not only by those who . . . hold that we should analyze explanations and justifications differently, but also by those who claim that – at least for purposes of critical examination and evaluation – explanations are NO different from justifications. What, then, is the point of contention? It is whether the (admitted) distinction between explanations and justifications provides a reason for treating them differently. . . . . It is beside the point to argue against holders of this latter position that there is a difference between explanations and arguments, for their position does not deny this point. It is only the difference these differences make which it calls into question. Kasachkoff, like Govier and like most who write on this subject, thinks that the matter is to be settled by showing that there are different normative constraints on the two things being evaluated; all that is then required to establish the distinction is an example of something that is successful as an explanation but unsuccessful as a justification, or vice versa. Let us break this down a little more. At one extreme, explanations and justifications have precisely the same criteria of evaluation, that is to say that the same normative constraints are operative, and so it is not necessary to decide “for purposes of critical examination and evaluation” whether a piece of reasoning represents explanation or justification. Slightly weaker, but still adequate for denying any purpose to making the distinction, would be the case where explanations and justifications have different criteria of evaluation, but these criteria were such that they were co-extensive, that is to say that they gave the same verdict of goodness or badness irrespective of whether a piece of reasoning is taken to represent explanation or justification. To put it in terms of reasons, if the reasons given are always equally successful in providing an explanation and an argument, then there is no purpose for making the distinction, even if we supposed that the reasons functioned in different ways in the reasoning. At the other extreme, explanations and justifications have different criteria of evaluation, so it is always necessary to make the distinction prior to proper evaluation of the reasoning. Not only is there no reason to suppose that a piece of reasoning will be good when evaluated as an explanation because it is good when evaluated as a justification or vice versa, but in fact this is never true; the criteria are incompatible. This, as indicated, is an extreme view and not one that I think anybody holds – it is not the view of Govier or Kasachkoff. They hold to a weaker version where the criteria are not incompatible and thus it is possible in principle for the same reasons to satisfy both sets of criteria. Not only is it possible in principle but it actually occurs in practice[i] – there are some questions for which the same reasons will perform both roles. Nevertheless, if there is some question for which this is not so, then this is a reason for the claim that explanations and arguments are different. I will call this the Identity Question. However, I am not convinced that this is adequate, and I would like to point out four ambiguities. Firstly, there is an act-object or process-product ambiguity in the terms ‘explanation’ and ‘justification.’ The acts of explaining and justifying are speech-acts, and it seems quite possible to follow the lead of McKeon (2013) in taking the distinction to be between the acts rather than the objects, and then difference in success is explained by the speech-act of explaining having conditions that the speech-act of justifying does not. Then, the only thing that counts for evaluation of the object is how well the reasons support the claim; furthermore, if all reasons-claim relations are deductive or can at least be represented in some logical system or other, then it is the object as a logical structure that concerns us normatively and that we need to evaluate. On the other hand, defenders of the distinction may still claim that there is a distinction between the objects or products themselves – even if these objects have the same logical structure this does not prevent them from being conceptually distinct, and for this reason from having different norms. One way of putting this is to say that defenders of the distinction may accept the act-object distinction yet still defend a distinction between objects as a type-token distinction. [ii] It is no small task to determine whether the norms in question are norms for the successful performance of a speech-act or the goodness of the object. Secondly, there is an ambiguity in the word ‘argument’ that motivated my shift to speaking of justification above. In the logical sense of the word, ‘argument’ is just an abstract object, propositions arranged in a particular structure that exhibits logical inter-relationships between them, by evaluating which according to well-known canons of logic we are able to judge whether the argument is good. A piece of reasoning is good if and only if the reason supports the claim. The goodness of the reasoning can be evaluated by reconstructing it as an argument and evaluating the argument (by showing that it is valid, if the argument is deductive). It is another sense of the word ‘argument’ that seems to be being distinguished from explanation in this literature. “In arguments, premises are stated in an attempt to prove, or justify, a conclusion,” says Govier (1987, p.159). ‘Justification’ and ‘proof’ are then considered to be synonyms for ‘argument’ in the sense at issue. The claim that explanations are distinct from arguments is then the claim that explanations are distinct from justifications. [iii] As we have already seen, this leaves open the question whether it is a distinction between products. Thirdly, I wish to note an ambiguity in the title itself. Govier takes herself to be giving reasons why arguments and explanations are different, but what kind of “why”-question does she take herself to be responding to? A request for a justification that arguments and explanations are different or a request for an explanation of why they are different? Nobody denies that these are different questions, but do they need different answers? Do the reasons Govier gives serve to answer both questions? If they do, and are equally good for both purposes, then the topic question of this paper is at least one instance where, whatever the conceptual distinctions between justifying something and explaining something, the object we use to argue and explain, that is to say, the reasons we give are the same. Govier (1987, p.171) allows that after a justification has shown that you should believe something, sometimes the very same reasons will help you understand why it is true. Presumably she feels that the chapter under discussion falls into that category. Fourthly (though not strictly an ambiguity), there is also another question that our topic question might be confused with, and that is “Can an informal logician make the distinction between an argument and an explanation in a given piece of discourse?” Sometimes they obviously can, for instance, when the speaker begins with “Let me explain: . . .”, or is the response to the question “Explain why . . .” But most of the time it will not be so simple, for it is only rarely that we explicitly use in discourse the illocutionary verbs that identify the speech-act that we are performing, and rarely that we explicitly request an explanation rather than just asking a “why”-question that is interpretable as a request for an explanation or for an argument. So let us suppose that the context of the discourse does not solve this. Also, it is not to be solved by appeal to specialized knowledge in the domain of which the discourse is a part, for what we have then is not informal logic but applied epistemology of the particular discipline. [iv] If an informal logician can make the distinction between an argument and an explanation for a given piece of discourse then they must do so by appeal to linguistic indicators that they find in the discourse itself and perhaps common knowledge that is not domain or discipline-specific. The question “Can a distinction be made in practice?” I will call the Analysis Question. If it cannot be done – if the distinction cannot actually be made – then the tenability of the distinction becomes a rather academic exercise. It is important, therefore, that we should be able to answer “yes” to this question. Before going on to Govier’s defence of the distinction, it is worth pointing out that there is one fairly trivial sense in which all justifications are explanations. When I give my reasons for thinking that something is true then I am also explaining firstly why I think that it is true and secondly (often) the normative fact that everybody (or at least everybody who accepts my premises) should think that it is true. What I am not necessarily doing is explaining why it is true. Note that in each case the conclusion or explanandum is slightly different, i.e., p, I believe that p, everybody should believe that p. The reasons are different too. If I am asked why I believe that q I might answer that I believe that p and I believe that p→q, and that I believe that q must be true if p and p→q are true; the logical principle modus ponens here becomes a principle of rationality telling me what I should believe given other things I believe. If I am asked why q is true, though, beliefs don’t come into it and I will say only that p and p→q are true, and that q must be true if p and p→q are true. Govier (1987, p.159) starts by pointing out that linguistic indicators like “thus,” “therefore,” “since,” and “because” occur equally in arguments and explanations, and that some sets of statements are interpretable either way. How does this affect our questions? It seems we have reason to answer, provisionally at least, negatively to the Analysis Question; linguistic indicators do not on their own favour interpretation as an explanation or an argument. If informal logicians are to make the distinction after all (or at least to make the distinction prior to the evaluation[v]) then this is only on the provision that common knowledge has the resources for doing so. We have reason also to answer negatively to the Identity Question, for whether it is an explanation or an argument that is requested, any answer that we can give in discourse will be reasons that are linked together by these kind of indicator words, and unless there is a semantic difference between these words as they occur in arguments and explanations – i.e., these indicator words are ambiguous – then the object that we get out of the discourse by analysis will be the same both logically and semantically, irrespective of whether it is analysed as an explanation or as an argument. I can find nowhere that Govier claims that these words are ambiguous. [vi] This seems to imply a token-identity between explanations and justifications, at least in so far as informal logicians are able to determine the token through analysis of the linguistic indicators. It also implies that it is the product that is in question, for this is what we can get from analysis of a text. So, the defence of the distinction depends, as I suggested above that it must, on establishing the necessity of a type-distinction, which is to say, on establishing different normative standards for the products. Govier next discusses the claim of the deductive-nomological model that all explanations are arguments, or at least, that it is a particular type of argument in which one premise is a covering law. There are actually two claims here that Govier might be referring to but which she fails to distinguish; in fact, the discussion of this issue in the informal logic literature is something of a terminological muddle. The first is that explanation in the object sense is an argument in the purely logical sense of the word ‘argument,’ though with certain additional logical features that distinguishes them from other arguments; not every argument, or even every valid argument, can be used as an explanation. The second is that explanation in the object sense is structurally identical to prediction. If a proposed explanation is to be sound, its constituents have to satisfy certain conditions of adequacy, which may be divided into logical and empirical conditions. . . . I. Logical conditions of adequacy. (Rl) The explanandum must be a logical consequence of the explanans; in other words, the explanandum must be logically deducible from the information contained in the explanans . . .
(R2) The explanans must contain general laws, and these must actually be required for the derivation of the explanandum. . . .
(R3) The explanans must have empirical content; i.e., it must be capable, at least in principle, of test by experiment or observation. . . .
II. Empirical condition of adequacy. (R4) The sentences constituting the explanans must be true. . . .
. . . Let us note here that the same formal analysis, including the four necessary conditions, applies to scientific prediction as well as to explanation. The difference between the two is of a pragmatic character. If E is given, i.e., if we know that the phenomenon described by E has occurred, and a suitable set of statements Cl, C2, . . . , Ck, L1, L2, . . . , Lr, is provided afterwards, we speak of an explanation of the phenomenon in question. If the latter statements are given and E is derived prior to the occurrence of the phenomenon it describes, we speak of a prediction. It may be said, therefore, that an explanation is not fully adequate unless its explanans, if taken account of in time, could have served as a basis for predicting the phenomenon under consideration. Consequently, whatever will be said in this article concerning the logical characteristics of explanation or prediction will be applicable to either, even if only one of them should be mentioned. This is the second claim referred to above. If we take a prediction that something will occur as a proof that it will occur (if the explanation is sound), then this seems to be what Govier wishes to distinguish from an explanation. It is important to note that Hempel does not deny a pragmatic difference between explanation and prediction; the identity he proposes is structural – it is the same object that is used to explain as to predict, and the features that make it a sound explanation when used to explain also make it a sound prediction when used to predict. Also note that Hempel is explicitly referring here to scientific prediction. Because the scientific explanation is adequate if and only if the scientific prediction is adequate – or perhaps we might say would have been adequate or successful if the premises were given and taken account of before the explanandum event – we do not need to make the distinction in order to evaluate them. An interesting point is that the structural identity thesis can be defended even if we deny that the structure involved is a logical argument or inference. What underpins the identity of explanation and prediction is the claim that reasons do not explain unless the conditional probability of the explanandum being true given the truth of those reasons is greater than 0.5, i.e., it is more likely to be true than false, and the closer this probability gets to unity the better the explanation and the more reliably we can predict that the explanandum event will occur. If it is less than 0.5, then it is not more likely to occur than not and we would not predict that it would occur. Obviously, deductive entailment is a limiting case where given the premises the conclusion must be true. Deductive and statistical arguments represent the relevant modal facts, but it is these facts themselves that underpin the identity thesis. Mellor (2006), denying that explanations are inferences, nevertheless endorses the identity thesis on the basis of this probability. However, against Mellor I would say that what we are attempting is not a conceptual analysis of explanation but merely a theoretical explication of its normativity; once it is agreed that deductive and statistical arguments actually can represent the relevant modal facts, that is all we need to determine whether the explanation and/or prediction is good or not, simply by evaluating the argument. This is odd in a number of ways. For one thing, Nozick is not here denying the structural identity of a proof and an explanation. Slightly before the excerpted segment, Nozick (1981, p.13) writes in perfect harmony with Hempel: “Even if (deductive) proof and (deductive) explanation have the same abstract structure . . . the pragmatics of the two activities differ.” For Nozick as for Hempel, there are pragmatic differences, but these are differences between the two activities and not between the objects, which have the same structure. 2. E is the (best) explanation for F.
It is premise (2) that does the work here, and this premise is a comment on the explanatory argument “E, therefore F” and not the argument itself or an element thereof. This, Govier (1987, pp.169-70) says, is an argument, not an explanation. So we do not here have a case where the explanandum ‘shifts certainty’ to the explanans. All Govier’s talk about pragmatic direction and certainty shifts has actually nothing at all to do with the structural identity thesis and is orthogonal to the Identity Question; we could concede these and still claim that the products are identical. What she needs to show is that the differences that everybody admits to are not simply differences between activities (Nozick) or speech-acts (McKeon) but actually differences in the products. I suggested above that she could concede that these products are token-identical, but argue that we must make a type-distinction between them. Recall that the Identity Question asked not only whether there was a question for which the same reasons could be given as an answer, but whether those reasons were equally good for both purposes. Govier’s task, then, is to show that they are not, in general, equally good. This is getting ahead of ourselves, though. Govier’s next attack is on Stephen Thomas’ four reasons for abandoning the distinction between arguments and explanations for pedagogical purposes. Thomas does not deny that there is a distinction, or that informal logicians can make it, but seems to be saying only that comparatively unskilled informal logicians cannot make it (hence it should be abandoned for “pedagogical purposes”). This is a version of the Analysis Question. More important is his deflationary claim that there is actually no point in making it, for what we are really evaluating in either case is the reasoning involved, i.e., how well the reasons support the conclusion. If this is so then it amounts to answering negatively to the Identity Question. Thomas uses the term ‘argument’ to cover both justifications and explanations simply because they both contain reasoning (Thomas, 1981, pp.11-14) and it is the reasoning that we seek to evaluate. Thomas’s first reason is that sometimes our discourse is explanatory and justificatory at the same time and on the same interpretation: “An argument that x is true may also constitute an explanation why X is true” (Govier, 1987, p.163). According to Govier, Thomas argues that making a distinction between argument and explanation amounts to saying that explanation falls outside the scope of what can be evaluated by logic, and correctly points out that we can claim that explanations are logically evaluable without assimilating them to justifications. The existence of some discourses that are explanatory and justificatory at the same time and on the same interpretation is not sufficient to deny the viability of making a conceptual distinction. Perhaps also the explanatory discourse need be good only in the trivial sense of explaining why I think or believe something [mentioned in the first section and in Wright (2002, p.37)]. If so, Govier is arguing past Thomas. Her point that the distinction is not shown not to be viable simply by the fact that some discourses are good in both ways is valid, but not one I think Thomas should be taken as denying. The example of discourses that are good in both ways is meant to respond to the Analysis Question more than the Identity Question. It is the difficulty of making the distinction that makes Thomas’s claim that we do not need to make it in order to evaluate the reasoning so welcome, and if it were not so difficult this deflationary claim would serve little purpose. So, all I think that Thomas is trying to establish here is this difficulty, and Govier’s criticisms miss their mark. Thomas’s second point is that making the distinction relies on extra-logical factors: function, social purpose, psychological factors. Again, Thomas (according to Govier) is assuming that arguments are within the scope of logic and that explanations are not. If the extension of the term ‘argument’ is relative to these kinds of factors, then either the scope of logic is also relative to the same factors (Govier, 1987, p.163) or, perhaps, the same product is sometimes evaluable and sometimes not. Again, I see no evidence that Thomas really does make the assumption Govier accuses him of making. His main objective, here just as in his first argument, is to raise problems for answering affirmatively the Analysis Question. But let us suppose that we are in fact able to make the distinction. The next point is that goodness should not be relative to these kinds of factors – if an argument is good, it cannot become bad just because it is used for a different social purpose (explaining why its conclusion is true might qualify as such a purpose) or because the arguer loses faith in its premises. We only ever need to evaluate the product as an argument, any distinctions being a distinction between functions and purposes and not between products. We see again that the issue actually turns on what we are evaluating when we evaluate arguments and explanations, whether it is the product itself or an act, and, if it is the product, whether this a distinction we can make on the basis of common knowledge. This difficulty for the Analysis Question is emphasized in Thomas’s fourth argument where he says that pragmatic factors are often not revealed by the text. Again, this is related to the Analysis Question. Granted there is a distinction of some kind between argument and explanation (which nobody denies), there is no point trying to make it if it cannot be made (because of the vagueness of the linguistic indicators) and would make no difference to its evaluation or goodness even if it could be made. 1. Jones is a liberal. 3. Jones is a bachelor. 4. Jones is a fat, liberal bachelor. 5. There are fat, liberal bachelors. 1. Doctor Smith has predicted that Susan will catch the measles. 2. Doctors are almost always correct when they predict that children will catch the measles. 3. Susan will catch the measles. This is a good inductive argument but in no way explains why Susan catches the measles. 1. The measles virus causes measles to occur more often than not in those exposed to it who have not had measles before or been vaccinated against measles. 2. Susan has been exposed to the measles virus and has not had measles before or been vaccinated against measles. Only the latter argument is a good scientific prediction; the former is not a prediction at all but a justification of a prediction. Note that both arguments are statistical, but only in the second is the statistical premise a covering law. 1. Susan is presenting what looks like Koplik spots. 2. When children present what looks like Koplik spots they almost always have the measles. 3. Susan has the measles. In her next example she notes that in retrodictive inductive arguments facts that are true now can be used to argue that something occurred in the past but cannot explain it; for instance, the use of fossilized remains to substantiate claims about our prehistoric past and the use of archaeological remains to substantiate claims about ancient civilizations (Govier, 1987, pp.165-66). Govier (1987, p.166) then generalizes this result, claiming that there are many cases where we have good evidence and reasons for thinking that something is the case that do not explain why it is the case. I find this curious. Certainly, when a prediction, or retrodiction for that matter, is established (because the prediction is validated by observation or because a retrodiction is corroborated by other independent evidence, for example) then that fact is evidence for the truth of the premises, but we would not expect it to either explain or predict the premises. As I have already said, confirmations are not predictions, and this has nothing to do with the structural identity thesis. We would here be arguing from the conclusion to the premises, whereas both explanation and prediction argue from the premises to the conclusion. [xi] Perhaps Govier would say that her only point is that we would call this a good argument but not a good explanation. On these modest terms she succeeds. I would say only that the type of inductive argument that confirmation theory studies is not one we would expect to be a good explanation, but is in fact the converse of the explanatory and predictive relation. 1. Smith is a Communist sympathizer. 2. Cuba is a Communist state. 3. Smith’s account of conditions in Cuba is flawed and biased. As an argument this is fallacious ad hominem, as Thomas concedes, so he should not, if he thinks that the criteria of evaluation are the same, think that the explanation is good. Yet, if we consider (3) as an explanandum that is already known, then (1) and (2) provide a very plausible explanation of that fact. We can see (1), (2) therefore (3) as an inductive-statistical explanation that explains (3) by making it probable. It is not clear to me that this is a bad argument. For one thing, we normally speak of ad hominem argumentation when accusations of bias are made regarding the premises and not, as here, when it is in the conclusion. That Smith is biased is a claim that is either likely given the premises or it is not; it depends on an unstated statistical premise concerning the veracity of accounts of Communist states by Communist sympathizers. But the same unstated premise seems to be tacitly appealed to in the claim that (1), (2) therefore (3) is a good inductive-statistical explanation (which, in the absence of a statistical premise is not a statistical argument at all) that explains (3) by making it probable, but by making it probable it seems that this succeeds to the same extent in proving that Smith is biased. Even if we do count it as an ad hominem it is not obvious that it is fallacious, since all that it is really saying is that Smith is likely to say sympathetic things about Cuba whether they were true or not. The explanation is as good or bad as the argument. Smith seems to be a counterpart to Jones. In the Jones example, the argument was good but the explanation bad. In the Smith example, the argument is (allegedly) bad but the explanation good. I want to note one thing with regards to the Analysis Question regarding both of these examples. It is not that Govier makes the distinction between explanation and argument prior to evaluating the example; no linguistic indicators, no common knowledge, no empirical data at all seems to favour one interpretation over the other or is appealed to in making the distinction. In the end it is the Principle of Charity that makes the distinction. Rather than making a distinction prior to evaluation, Govier essentially evaluates the example under both interpretations and then makes the distinction on the basis of the evaluation, charitably attributing that interpretation under which the example turns out good. I mention this only as an observation, for I do not think adversely affects Govier’s argument unduly, for we can probably relax the requirement that says that the distinction must be made prior to the evaluation. Sometimes we explain something even without making it probable. This means that explanation can get by with a weaker statistical premise than prediction. To this end she cites Scriven’s well-known paresis example where we explain why somebody got paresis by pointing to the facts that they had syphilis and that only syphilitics get paresis, even though it is only a very small percentage of syphilitics that contract paresis and so we do not make getting paresis probable. Salmon gives a similar argument. These (unlike Govier’s earlier examples) are serious challenges to the structural identity thesis; the statistical facts involved seem to be very weak evidential reasons to think that something will happen but good explanatory reasons for why it happened, given that it did. Many explanations which are customarily offered, especially in pre-scientific discourse, lack this predictive character, however. Thus, it may be explained that a car turned over on the road “because” one of its tires blew out while the car was travelling at high speed. Clearly, on the basis of just this information, the accident could not have been predicted, for the explanans provides no explicit general laws by means of which the prediction might be effected, nor does it state adequately the antecedent conditions which would be needed for the prediction. . . . In some cases, incomplete explanatory arguments of the kind here illustrated suppress parts of the explanans simply as “obvious”; in other cases, they seem to involve the assumption that while the missing parts are not obvious, the incomplete explanans could at least, with appropriate effort, be so supplemented as to make a strict derivation of the explanandum possible. This assumption may be justifiable in some cases, as when we say that a lump of sugar disappeared “because” it was put into hot tea, but it is surely not satisfied in many other cases. Thus, when certain peculiarities in the work of an artist are explained as outgrowths of a specific type of neurosis, this observation may contain significant clues, but in general it does not afford a sufficient basis for a potential prediction of those peculiarities. In cases of this kind, an incomplete explanation may at best be considered as indicating some positive correlation between the antecedent conditions adduced and the type of phenomenon to be explained, and as pointing out a direction in which further research might be carried on in order to complete the explanatory account. Hempel here seems to be suggesting that such explanations are not really explanations, or at least not scientific explanation, but are at best incomplete explanations which when completed would allow the prediction of the explanandum event; being syphilitic does not explain why someone contracted paresis, and will not until it is explained why some syphilitics get paresis and others do not. This is a research question that, by considering the given explanation to be already good, might have been deemed unnecessary. The appearance of a good explanation is because of the pragmatic reason that it names a relevant difference that someone who did not already know that it is only syphilitics who get paresis might find informative – indeed, it is essentially Mill’s Method of Differences. Also, we see Hempel say that symptoms and indicators do not suffice for a prediction. Still, maybe Hempel and Mellor are too casual with our linguistic intuitions here, and later Hempel relaxed the conditions on inductive-statistical explanations in response to these kinds of objections. However, I wonder whether this really helps Govier, for once it is raised that the goodness or apparent goodness of an explanation or explanatory reason depends on pragmatic and contextual factors, the issue of whether these factors are part of the evaluation of the product is also raised. Pragmatics governs a kind of activity, and not the product, and the pragmatic goodness of one is not necessarily the rational goodness of the other, although a good and complete explanation should be good whatever the pragmatic and contextual factors. Do our linguistic intuitions track the appropriateness of giving a reason as a speech-act, or the goodness of the resulting product? If you know that the author of the above discourse is not leaving, an explanation of why she is leaving would not make any sense; if you know that she is leaving, a proof that she is leaving is beside the point. Now, saying that an argument is either beside the point . . . or else that the argument fails to make sense, is to make an evaluation of its success. The kind of success that Kasachkoff seems to be referring to here is perlocutionary success, but this is not a kind of success that can make a proof less good. Suppose that I prove Pythagoras’s Theorem to you, and then you tell me that you already knew this. In a sense my proof was a waste of time, but this does not make it any worse as a proof; it is as good as it ever was, and cannot become bad because of psychological facts about you. As I said earlier when discussing Thomas, what should not be relative to pragmatic and contextual factors is the goodness of arguments and explanations; it is no problem that where and when the distinction between arguments and explanations is to be drawn is relative to these factors. Kasachkoff’s analysis of this example only seems to reinforce the thought that the distinction is between speech-acts. Govier does not seem to realize this issue or provide us means to decide between these options. This seems to be only exacerbated in the next section where Govier (1987, p.168) explains why explanation and argument are different: justifying evidence appropriate for showing that something is the case is not in general appropriate for explaining why it is the case. Their appropriateness is tied to the different function of the social processes for which they are typically used. Arguments are used for rational persuasion, and even when not used this way because the conclusion is not in doubt, this does not alter the basic asymmetry between arguments and explanations. But this asymmetry seems to be between the social processes, not the products. Here she concedes, as we noted in section 1, that there are occasions where argument and explanation are at least token-identical and which are equally good as arguments and as explanations. This is, of course, quite consistent with their criteria of evaluation being different; it is simply that the same reasons can satisfy both sets of criteria. In consequence, it is also consistent with there being a conceptual distinction between arguments and explanations, which depends on there being different criteria. Another of Thomas’s examples gives convergent reasons for the conclusion. Here too, she allows that these reasons can also be good explanatory reasons, albeit the explanation is not a deductive-nomological one. These concessions, she notes quite correctly, only shows that these passages are good by the criteria of both explanation and argument and not that these criteria are the same. In fact, they cannot be the same, for then this would follow for all passages and it would be impossible for there to be good arguments that are bad explanations and vice versa (Govier, 1987, pp.172-73). We see that Govier does not propose the kind of extreme view that denies that any good arguments can also be good explanations, or vice versa. (REASON) I learned religion at my mother’s knee. (MISSING EXPLANATION) People usually persist in believing those things that they learn at their mother’s knee. That is (the cause) why I believe God exists. (MISSING ARGUMENT) Most of what people learn at their mother’s knee is true. Therefore, (probably) God exists. Govier (1987, 174) suggests that this works better as an explanation and that in most contexts it makes little sense to ask for a justification. Note that this is not an explanation of why something is true but of why the speaker believes it, which we have already said is a trivial sense of explanation and certainly not the one pertinent to Hempel. Note also that construed as an argument it is not a prediction but a justification of a prediction. So, this is not a counter-example to the structural identity thesis, firstly because it is neither a real explanation nor a real argument in the senses discussed, and also because, anyway, the structures are different, since there are different conclusions, and consequently (it should come as no surprise) different missing premises that we need to add to complete these enthymemes. What is slightly more surprising is that even after completed in the most charitable way possible the explanation of why the speaker believes something still seems that much more plausible than the justification. Noting how the inserted material differs in these cases and how the conclusion of the argument differs from the statement of the explanandum, we can see that the argument/explanation distinction retains considerable epistemic and practical significance. The force of ‘why’ questions and ‘because’ answers varies, depending on whether we deal with a request for an explanation or a justification. Different claims are differently relevant, and different standards of success apply. To be sure, reasoning is used both in explanations and in arguments. Without the full context, some responses could be taken as either one or the other. Nevertheless, the distinction retains its pragmatic significance, and the pragmatics of the matter are related to our logical and epistemic appraisal of the result. But here the inserted material is different simply because the conclusions are different. It is true that we can respond to some requests for justifications with confirmations and justifications of predictions, and these are not identical to explanations. But the only genuine explanations that may not, perhaps, be genuine justifications, are those whose statistical premises do not confer high likelihood on their conclusions. This is an old point that Govier has nothing original to add to; everything else she says fails to make the distinction as a distinction between objects. What do we mean when we say that explanations and arguments are different? As Kasachkoff says, nobody denies this. Nobody denies that the intention to explain and the intention to justify are different intentions. Since communicative intentions are related to the illocutionary force, the distinctness of the speech-acts of explaining and justifying are also different, as all must agree. All can agree also that they have different perlocutionary effects: understanding in the case of explanation, justified belief in the case of justifying. All can also agree that understanding has different conditions to justified belief; to understand why something is so is not only to have a justified belief that it is so but also, plausibly, to grasp the modal fact that it must be so, given other conditions. If any normative difference between the speech-acts comes down to a difference in conditions of perlocutionary success, then it seems as if all good explanations should provide good reasons for believing that the explanandum is true and that it must be true. Consequently, all good explanations would be good arguments, although not all good arguments would be good explanations. Furthermore, there would be no need to make the distinction between explanations and arguments, for whatever claims (including the modal claims) are made, the reasons would either support those claims or not, and this is a matter of logically evaluating the product. As Thomas says, for the purposes of evaluating the reasoning we would need only to establish whether the reasons support the claim or not, and would not need to make the distinction between the products of explanation and justification, but only if at all between the acts when, using charity (often post-evaluation, as we have seen), we attribute communicative intentions to the arguers. When we say that there is a distinction between explanations and arguments, and that it is a (type-) distinction between the objects rather than the acts, this can only be because there are good explanations that are not good arguments. All of the talk about “pragmatic directions” and “certainty shifts” is quite compatible with the distinction being between acts and is thereby irrelevant for evaluating the goodness of the reasoning involved; both Nozick and Hempel concede that there is this difference without conceding that it is a difference between the products. Another red herring is the fact that we often cite evidence as our reasons for believing something but this evidence does not explain why something is so. This is obviously true, but shows only that observing that something is so is not to observe that it must be so. However, if we conjoin our evidence with a law (even a law of co-existence) to argue for another particular statement, then this would justify belief in the modal claim involved. In this case, arguments that satisfy Hempel’s (R1) to (R3) would be explanations, and would be good explanations to the extent that they justified the modal claim, i.e., to the extent that the law confers a high conditional probability. It is because of this high probability that there is an identity of explanation and prediction, and not because explanation has a particular logical form; we can claim a structural identity even without committing to any particular type of structure. If Hitchcock (2011) is right, then this is so for all arguments after all, since according to him the semantics of “therefore” wherever it appears contains implicit reference to a generalization that backs counterfactuals, which seems near enough to a law as to make no difference. However, I am not sure that Hitchcock is right about this, and this is not the place to argue the issue. I say only that if you want to explain not only why you do believe something but the normative fact that you should, you need some kind of law to support the modality involved. I would not like to say, and nor would Hempel, that all arguments obey (R1) to (R3). It is no problem in making a distinction between explanations and arguments that do not obey (R1) to (R3), since we can make a distinction between arguments that do and arguments that do not obey (R1) to (R3). I think we can agree with Govier that there is this distinction, and several of her examples illustrate it, but this distinction is not a pragmatic distinction at all but a logical distinction, (R1) to (R3) being logical conditions. The interesting and controversial question is whether it is worthwhile, in Kasachkoff’s sense of meaning that we have to treat them differently, distinguishing between explanations and arguments that do obey (R1) to (R3). Saying that there are good explanations that are not good arguments turns out to be tantamount to saying that there are reasons that are good explanations but do not confer a high probability on the outcome. It should be noted that this applies to statistical-inductive explanation only and consequently does not affect the claim that all good deductive-nomological explanations are good predictions, and it should be noted also that it is deductive-nomological explanations that Nozick (1981, p.13) refers to in the excerpt previously mentioned. This is a very old point made by Scriven in his famous paresis example and which is appealed to by Govier. [xiv] It is typically conceded that there is a pre-theoretical intuition that we explain paresis in a patient by giving as a reason that he had untreated syphilis. The problem is what exactly to do with this intuition. In his early responses to Scriven, Hempel explained away this intuition on pragmatic grounds, while Mellor does the same on semantic grounds. Scriven and Govier take the intuition at face-value as a counter-example to the covering law model. But by doing this they seem to concede that the goodness of an explanation depends on the kind of pragmatic and psychological factors that Thomas says should not enter into the evaluation, and perhaps cannot be gotten by analysis of the discourse given the resources the informal logician has at his disposal. My feeling is that it makes sense to talk of the goodness (i.e., felicity) of a speech-act as depending on such factors, but less plausible to talk of the goodness of the product as depending on such factors; Govier’s appeal to Nozick for help only hinders her in showing the distinction to be a type-token distinction rather than (or as well as) an act-object distinction. What is the result of all this? For all that Govier says, the distinction between explanation and argument is a distinction between the speech-acts and does not need to be made if the argument is as Hempel describes it. Nobody denies that these acts are different. Therefore, I think the burden of proof is on the defenders of the distinction to show that the distinction is to be made in the place and in the way that they make it. I do not think they have met this burden of proof. Equally, I do not pretend to have proved that the only distinction is between the acts or that it is impossible to make a type-token distinction in the products. As I pointed out at the outset, it is extremely difficult to know how to decide between them. Hempel does not deny these pragmatic factors, but mentions them himself – they reflect different ways we may use an argument. Has Govier succeeded in giving reasons why explanation and argument are different? I don’t think so. She does not succeed in persuading me to believe that there is the kind of difference that she wants to endorse, for everything that she says is compatible with and can be explained by a distinction between the acts that everybody already accepts. For the same reason, she does not succeed in explaining why they are different, for all the differences she names could be differences between the acts. And if the differences between the objects are simply differences between different kinds of arguments – between those that do and those that do not satisfy (R2) and (R3) – then it is not very interesting, for we are still evaluating the explanation as the kind of argument that it is. It is not a distinction that means that we have to treat them differently. At most, she succeeds in telling us what some of the differences are, not what they are differences between, or, in the interesting cases, what differences the differences make. i. Wright (2002) describes classes of “why”-questions where the distinction seems to fade or even vanish completely. ii. Since he thinks that any distinction must be a structural one, McKeon (2013) fails to appreciate this kind of defence and much of his discussion is lacking for this reason. Johnson (2000, pp.98-99) rejects a structural definition of argument for the very reason that it lacks the resources to make the distinction between argument and explanation that he rather takes for granted it must. So, saying that there is the same structure is not in itself sufficient for the conclusion that the structures should be evaluated in the same way. Nevertheless, his proposal that the distinction is one between acts is certainly live. iii. This greatly complicates Govier’s discussion of Hempel, for Hempel uses ‘argument’ in the logical sense, but talks also of ‘prediction’ in a way that suggests that all predictions are proofs, but does not claim that all proofs are predictions. Discussion of this point will appear later. v. I make this qualification because we will see later Govier evaluate an analysed text as both an argument and as an explanation, and then using the Principle of Charity to give the text the interpretation under which it comes out best. For instance, if it comes out as a bad argument when evaluated as an argument but as a good explanation when evaluated as an explanation, Govier seems prepared to say that it is an explanation rather than an argument. vi. It seems to me that you might make a case for the “therefore” of an explanation requiring backing by a generalization, whereas the “therefore” of a justification does not. This would be a qualified acceptance of Hitchcock’s thesis that all uses of “therefore” have this kind of backing as part of their semantics (Hitchcock, 2011) and that “therefore” is ambiguous after all. Govier does not take this view here. vii. It is not just Govier; distinguishing arguments and explanations on pragmatic grounds is the orthodoxy in informal logic, e.g., Groarke and Tindale (2004, pp.20-24). viii. Govier writes here almost as if what she means is the acts after all, but this is not open to her since, going back to the Analysis Question for a moment, whatever it is that we evaluate must be extracted from the discourse by linguistic indicators and common knowledge, which is to say that it must be a product. ix. One might wonder whether this actually is a good argument, since it simply repeats in its conclusions what was in the premises and it is precisely these kinds of arguments that Govier is wont to claim are not ‘real’ arguments. However, since the premises do seem to be given “in an attempt to prove, or justify, a conclusion” in line with Govier’s definition, I will not press this issue. xi. Perhaps Govier is still under the confusion over the ‘certainty shift’ earlier alluded to. McKeon (2013) too seems to see the whole debate as pivoting on the difference between evidential reasons (confirmations) and explanatory reasons. xii. Salmon claims that explanatory reasons can also be negatively correlated with the explanandum; the condition is instead statistical relevance. Govier does not discuss this, so nor will I.
xiii. This is example B (Govier, 1987, p.170). xiv. Another example put to me when I presented this paper is the following: we can explain why Usain Bolt is the best sprinter on the grounds that he has the best genetic endowment, the best training, etc. But we have not justified the claim that he is the best sprinter, for which we need to appeal to the races he has won, etc. Without this, it might be thought, we can say that he is a good sprinter, but not that he is the best; it is a different set of facts that we need to appeal to in order to warrant use of the evaluative term “best.” Do we explain why Usain Bolt is the best sprinter on the grounds of having the best genetic endowment etc.? Only, I think, by appeal to the statistical premise that those who have the best genetic endowment etc. will be the best sprinter. This is disguised in the current case because “best” in “best genetic endowment” simply means “genetic endowment most conducive to being the best sprinter.” With the addition of this statistical premise, the same reasons do also justify the claim that he is the best sprinter. It is true that we can give reasons for him being the best sprinter that do not appeal to such things but only to, e.g., the races he has run, and these reasons will not explain why he is the best. But such reasons amount to inductive confirmations that he is the best sprinter, and I have said that confirmations are distinct from explanations and justifications. All these distinctions are logical distinctions. Govier, Trudy. (1987). Problems in argument analysis and evaluation. Dordrecht: Foris Publications. Groarke, Leo and Tindale, Christopher. (2004). Good reasoning matters! 3rd edition. Oxford and New York: Oxford University Press. Hanson, Norwood Russell. (1959). On the symmetry between explanation and prediction. The Philosophical Review, 68 (3), 349-358. Johnson, Ralph. (2000). Manifest rationality: a pragmatic theory of argument. Mahwah, New Jersey: Lawrence Erlbaum Associates. McKeon, Matthew W. (2013). On the rationale for distinguishing arguments from explanations. Argumentation, 27 (3), 283-303. Nozick, Robert. (1981). Philosophical explanations. Cambridge, Mass. : Harvard University Press. Suchting, W. A. (1967). Deductive explanation and prediction revisited. Philosophy of Science, 34 (1), 41-52. Thomas, Stephen N. (1981). Practical reasoning in natural language, 2nd ed. Englewood Cliffs, NJ: Prentice-Hall. Wright, Larry. (2002). Reasoning and explaining. Argumentation, 16 (1), 33-46. 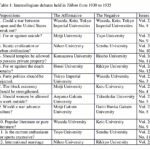 ISSA Proceedings 2002 – A Pragma-Dialectical Analysis Of Televised Town Hall Meetings Following The Murder Trial Of O.J. Simpson: Competing Demands And The Structure Of Argumentation Practices.